What is the runt of the litter? Do puppy litters always have a runt? How to care for a runt of a litter? Are runts more prone to medical conditions? Are there any reasons to buy the runt of the litter? A runt of a litter is a puppy that is seemingly weaker than its littermates. 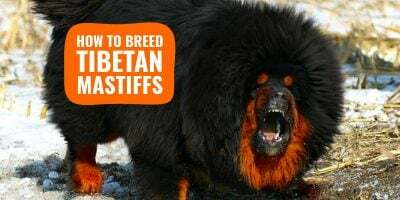 Once a female dog goes through labor and delivers her whelps, there will be discrepancies in the newborns’ colors, patterns, body shapes, temperaments, and sizes. If you have siblings, you all aren’t born equal; the same goes for dogs. Generally, there will be one or a few puppies looking slightly bigger, and perhaps more active and outgoing. On the contrary, there is usually one or two puppies looking a little smaller, weaker, and less of a fighter especially when it comes down to meal times. Puppies get to the mother and latch on her teats to get their milk; in crowded litters, you may have to wait for your turn, or impose yourself. The runts of a litter are usually the last ones to eat which consequently hinders the runts’ growth. It is somewhat a vicious circle. The runt of a litter is not a veterinary term per se. It is a term that a layperson uses to describe any offspring that is smaller than its siblings or just looks too small for its species or age. A puppy born in a litter of many puppies can be labeled the runt simply because it is the smallest among several or more puppies. Obviously, in a litter of six big puppies, a puppy of smaller size will be easy to spot. This small puppy labeled the runt may actually be of normal size for its age. Runt is a comparison that may not be an accurate or meaningful label. Because the term runt lacks a defined medical definition, an average person can think of runts like Wilbur the pig in the book Charlotte’s Web or the title hero in the movie Babe. As such, the runt of a litter may be perceived with a certain amount of romanticism and expectation of phenomenal ability not really characteristic of real life runt puppies. Another way to look at a runt would be a puppy that has physical disadvantages that prevent it from getting adequate nutrition and care from the dam. In the process of natural selection, there is competition among the newly born and infant puppies for access to milk and access to the warmest spots near the dam. Those puppies that early on have these physical advantages in strength and size tend to grow faster. Over few days and weeks, the difference that started out barely perceptible gets magnified. A puppy that may not be conspicuously smaller or sicker than the littermates at birth may become obviously a runt in a week. The reason for this is that for whatever reason this puppy is unable to compete with its brothers and sisters for milk and warmth. Some veterinarians and researchers believe the runt is determined at the time of conception. Runts may be the embryonic puppy that does not implant in the uterus in the most advantageous place. Right from the beginning, this particular puppy lacks the nutrients it needs for optimal growth. It is thought that puppies that implant closest to the ovary have more nutrients than those that implant in the center. However, not all research has confirmed this fact. Some people, also, think that the runt may be the product of a second breeding and is younger than the rest and, hence, premature at birth. This idea is dispelled because all the eggs of the female are released within 24 hours and implantation essentially occurs for all fertilized eggs at the same time. Not every litter of puppies has a runt. A singleton litter, obviously, would be one of those litters without a runt. It is possible with litters of more than a single puppy not to have a runt or to have two puppies that look like runts. The label of runt of a litter is a layperson’s label—a “know one when I see one” type of judgment. Since the average litter of puppies for all dogs is roughly six puppies most litters will have a puppy that is smaller than the rest, and this puppy will generally be labeled as the “runt”. Again, if the siblings are larger than average an average sized pup may, by comparison, be called the runt. Since it is unlikely that a litter of pups will all be the same size almost every litter will have one pup that is noticeably smaller than the rest. As a breeder, you may need to help feed runts for them to reach a more normal weight. The first thing to do for any litter of puppies is to not assume by eye that all the puppies are the same weight. It is essential to take a weight of each puppy when it is born. A small birth-weight puppy should be identified and labeled as a “watch”. Small birth weight is defined as a weight that is 25% less than the birth weight for the breed. These puppies have a very high mortality rate. It is helpful to watch the dam and make sure she does not reject this puppy or that the littermates straightaway do not prevent it from nursing. A second weight after 48 hours will provide a breeder more information in identifying a runt. Puppies should add no less than 4 % of their birth weight in that timeframe. A small puppy that does not make this mark can either be hand fed or helped out by giving it a bit of human help by positioning it at the teat closest to the dam’s tail where warmth and nutrition are at its maximum. Of course, the dam should be looked at for conditions which would cause inadequate milk supply like lactation failure, eclampsia, or mastitis. These conditions have to be addressed for the health of not just the runt but the whole litter and, ultimately, the dam herself. Medical conditions of the dam like E. Coli infection or viral conditions should ideally be caught and cured prior to breeding. Any infection or transmittable disease of the dam will strike a smaller puppy or the runt with worse consequences than the more hardy pups in the litter. 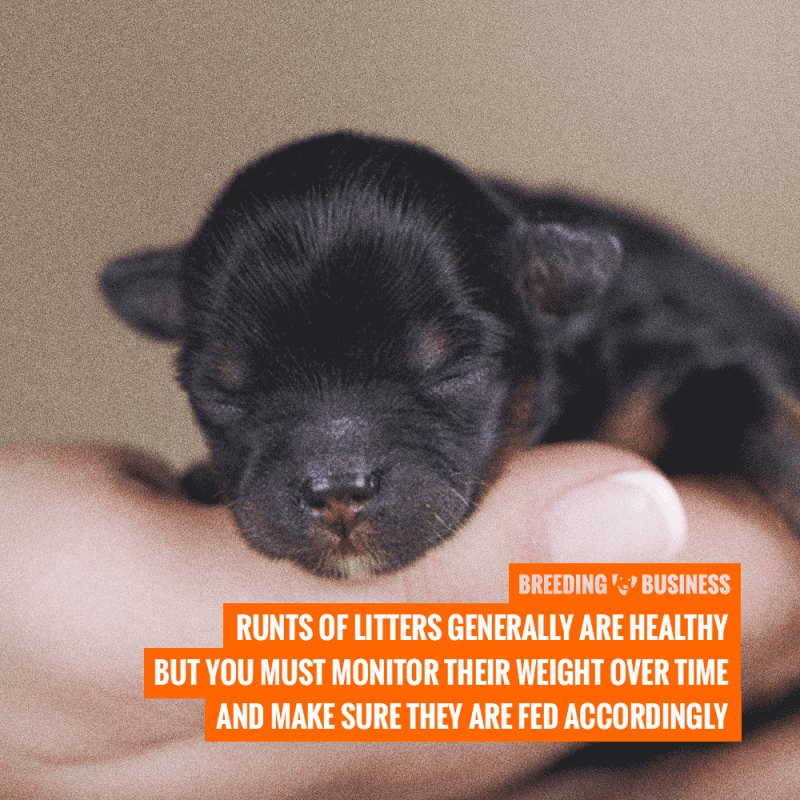 Between birth and ten days, the litter should be monitored for both weight and nursing behavior. A puppy that seems to sit away from its siblings and does not latch onto a teat and vigorously suckle should be pulled for hand-feeding. A runt puppy that has not doubled its birth weight by ten days should be hand-fed. If the runt is suckling fine but is wrestling with many brothers and sisters for an available teat, a supplemental feeding or two can help fatten him up and even the playing field. At about three weeks, the weaning period usually begins for puppies. Runt puppies should be separated from the litter when starting solid food. The separation reduces the competition from the larger littermates. The amount of food and the appetite of the runt puppy can then be more closely monitored. If necessary, more high-calorie puppy foods and supplements can be added to the diet to help add body weight. There are commercial puppy supplements (e.g. 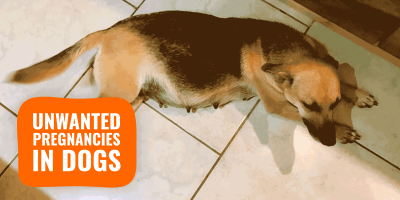 nutrition gels) but these are recommended by the manufacturer for older puppies (8 weeks). It is best to get a veterinarian’s advice as to the kind and amount of supplements to add to a young puppy’s diet. 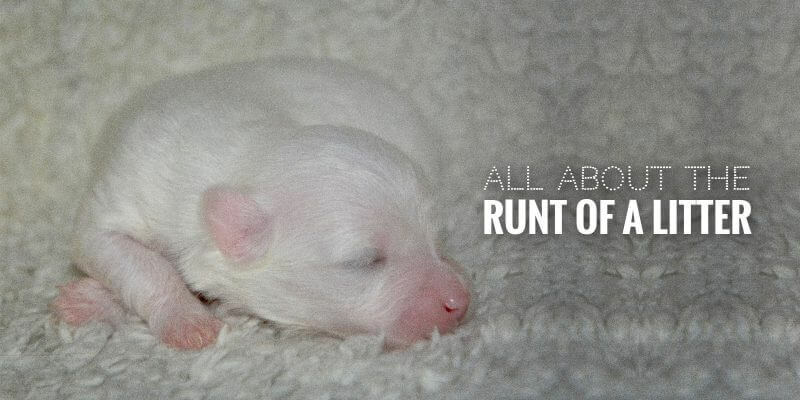 Unfortunately, the biggest medical risk of runt puppies is death. Puppies with a small birth weight have a very high mortality rate. These puppies, also, are more susceptible to fading puppy syndrome which happens in the first two weeks after birth. In fading puppy syndrome a puppy becomes lethargic, fails to gain weight, may vomit and have diarrhea, and may make a distinctive high pitched cry. The dam may reject this puppy and her rejection may hasten its death. Human intervention can save a fading puppy if the condition is recognized early on. It is vital to monitor the weight and behavior of the new litter. Human intervention can save puppy by providing adequate warmth and supplemental nutrition either by hand feeding or with the instruction of a veterinarian glucose injection. Sometimes low birth weight is associated with congenital problems in the puppy. If a puppy has serious congenital problems, this puppy may be rejected by the dam, will fail to thrive and may not survive even with the best human attention. It is a fact that a certain percentage of newborn puppies simply can’t be saved. The mortality rate of puppies within the first eight weeks has been found in studies to be 17-30%. It is important that a veterinarian examine a very low birthweight puppy within the first few days of life. 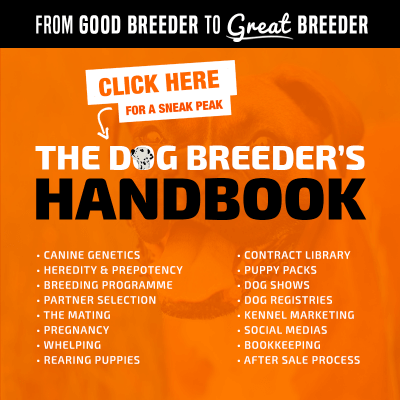 Some defects that may show up in runt puppies like cleft palates (which make it difficult to feed) and heart defects can be diagnosed early on with appropriate veterinary treatment to follow. Some of these puppies, unfortunately, will have to be euthanized. A watchful eye will help spot runts that fail to thrive and those with serious congenital problems will be spared unnecessary suffering. Other problems that may underlie inadequate growth include such things as infection and parasites. Newborn puppies are very susceptible to infection particularly if they were unable to receive immunity from the dam within the first 12 hours of birth. Runts at birth that don’t latch on and don’t suckle after birth can be deprived of the dam’s colostrum and the disease-preventing immunities it provides. In addition, runts are less able to withstand a parasite load that siphons off nutrients. Hookworms, in particular, can cause quick debilitation in a susceptible small puppy. Also, roundworms which are almost always passed on by the dam can cause failure to thrive and can endanger a runt puppy. 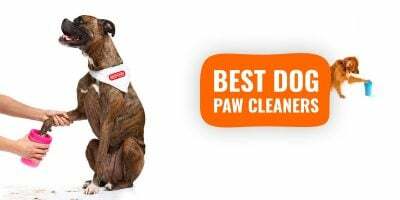 Fortunately, if identified most parasite infestations can be safely and effectively treated. Puppies born small, however, are not necessarily carriers of congenital defects. Small birth weight puppies can go on to be a normal healthy dog. Runts that survive to weaning are not any more likely to have medical problems than their littermates. Over time and with adequate nutrition these puppies will catch up and be the same size (or at least meet their genetic potential). Furthermore, like we explained earlier in this article, a runt of a litter is not a medical term, therefore, most puppies considered to be runts are probably within healthy weight range of their breed. In case of any doubt, check with your vet and monitor its weight regularly. A runt of the litter appeals to many buyers. Runts are frequently the heroes in fiction and movies. The runt at eight weeks is a true survivor. Much like the fictionalized runts, the runt puppy has beaten the odds and has continued in its quest for life. The runt stands out among its many same looking littermates. Its diminutive size can be very attractive to many different buyers. Some breeders will look askance at a runt puppy. They fear it is unhealthy or carriers some congenital defect. A runt puppy that is as active as its siblings and has no signs of illness such as lethargy or unusual stools is as sound a pick as any of the other puppies in the litter. Often, dog breeders may sell the runt at a lower price because of the fear that a runt is somehow a risky choice. A wise buyer can take advantage of the lower price and acquire a puppy that will grow up to be the pick of the litter. 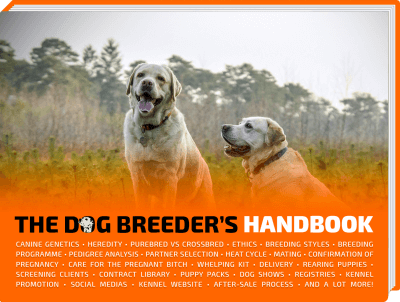 A wise purchaser, who knows the breed well, may be able to spot the potential in the runt. A runt that has made it to eight weeks has the same genetic start as its littermates. The genetic roll of the dice that resulted in a beginning small size may have endowed the runt with the markings and features of a dog destined for distinction in the show ring. Similarly, the traditional bias against runts warns of their innate inadequacy for breeding. Again, this bias is misplaced. A runt that has no signs of illness and passes the usual veterinarian examinations and any of the other many screenings for the breed should not be excluded from consideration. In fact, a puppy discounted in price because of being a runt may be a very good bargain either for the experienced buyer with the eye for potential or the beginning breeder looking for additions to a breeding program but with a shortage of investment cash. Of course, a runt that does not mature out to a normal and healthy size should be treated accordingly.